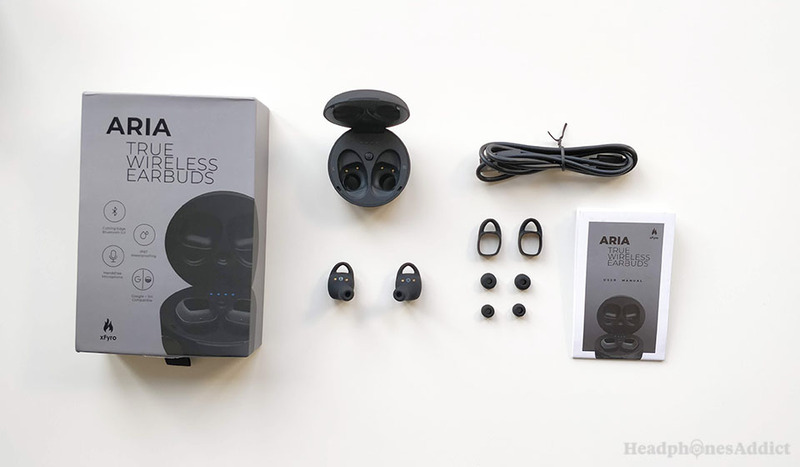 Can the xFyro Aria true wireless earbuds really compare to reputable brands or are over marketed. Probably the most recognized crowd-funded true wireless earbuds, the xFyro Aria make a lot of promises. Like the 8-hours battery per charge, plus 24 hours more in the carrying case is the best in class. Even premium true wireless headphones costing more can’t compare. Featuring Bluetooth 5.0 for a stable and distortion-free experience. Fully waterproof with the IP67 rating which means you can dip them in the water safely. Connect to multiple devices, enjoy the speed of quick charging, durable and comfortable design, and clear hands-free calling experience. But is all of it true? Or just a marketing over-promise? Find out the truth in this xFyro Aria earbuds review as we take a look at all of the categories. Or check them on the Indiegogo site. Getting a comfortable fit with true wireless headphones is tricky, but the Aria do a pretty good job. The buds are quite big but tend to stick in the ears well. You can easily use them for running and working out without worrying about dropping them. The earwings and lightweight design do a good job of keeping them in place. Now when it comes to comfort, things aren’t so great. The xFyro Aria are comfortable earbuds but not among the best in class. Once you get the right fit for your ears, you can wear them for hours without much discomfort, but you’ll always know you’re wearing them. It’s hard to forget about them because you’ll feel some pressure at all times. Also, the right and left ear buds have visible markings on them, so you always know which side fits where. Overall, the comfort is pretty good and doesn’t suffer from significant problems but isn’t the best you can get. Usually, we write about noise cancelling for headphones that actually have it. That’s not the case with xFyro Aria, but we have to clear some things up. On their official website they are claiming that these have noise cancellation but what they actually mean is passive noise isolation. There’s a big difference between the two, and you read up on that here. There’s no active noise cancelling in the xFyro Aria, except for the microphone CVC technology. But CVC works only for the mics and not earbuds. So, in case you were misled by their marketing. Now you know the difference. Passive noise isolation is good and will block out most ambient noise. So, we’ve cleared up the fact the Arias are not noise cancelling, but their passive noise isolation is pretty good. Like it’s usual for in-ear headphones they will block most of the background noise so you can enjoy your music in private. There’s almost no noise leaking outside and inside so you can happily blast your music knowing others can’t hear you. Now, keep in mind to get the right eartips. It’s crucial to use the tips that fit your ears. Without them, you’ll only get mediocre isolation. 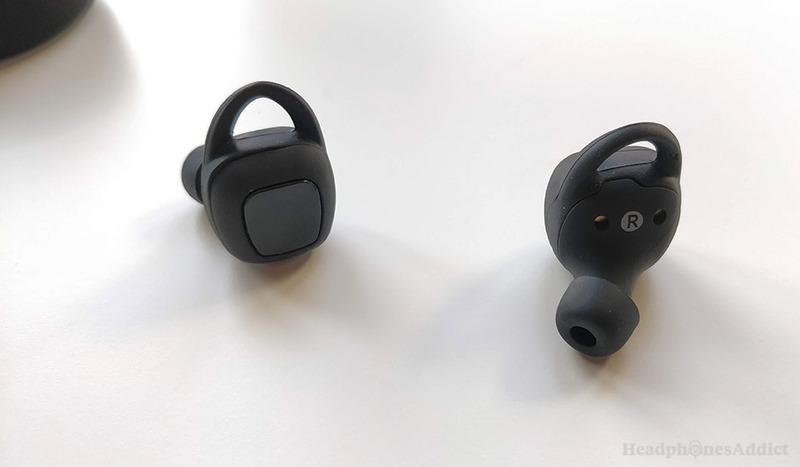 The xFyro true wireless buds feature the latest Bluetooth 5.0 which supposedly comes with many upgraded features. First, the Bluetooth range is only slightly improved from the standard 33ft to supposedly 35ft. We didn’t really test it because it wouldn’t make a big difference. You should expect the standard 30 something feet of uninterrupted range without obstacles. When you introduce walls, the xFyro Aria do well. The connection doesn’t get interrupted or distorted, as long as it’s just one wall of normal thickness. Multiple walls become a problem for all Bluetooth devices. Are they easy to connect? Connecting the Arias is super easy. Once the initial connection is established, the steps are in the user manual, you can easily turn off and disconnect the buds by placing them in the charging case (it has to be in charging mode). Similarly, once you want to use them, just take them out of the case, and they’ll automatically connect and pair (even if the case is turned off). It’s a good user experience once you figure it out and works as advertised. In spite of that, we did experience interference and distortion during our tests. The distortion appeared to come out of nowhere and for no apparent reason. While the buds never completely disconnected the occasional interruptions do take away from the overall impression. Might have been just our model, but it’s hard to say. Probably to save some money, they don’t support any special Bluetooth codecs as manufacturers have to pay royalties to use those. Nonetheless, a good codec is preferable but not a big problem. You can connect to your smartphone to accept phone calls while listening to videos on your tablet or any other combination. It’s a useful feature. Now the supposedly best advantage xFyro Aria have over the competition. The promised 8-hour battery life on one charge is comparable to non-true wireless earphones, and it absolutely destroys the competition. The battery in xFyro Aria true wireless headphones doesn’t last up to 8 hours (for an average user). We didn’t even get to half that. The charging case is sleek and feels premium. So, we tested the battery. Got the buds to 100% battery life and went on a listening spree. We tested for multiple straight hours at mostly half volume—sometimes a bit more or a bit less. During the listening session, we tested mostly inside but went on a 1-hour walk outside. True, extreme temperatures have an impact on battery capacity, but it was well above freezing temperatures (tested in February). It shouldn’t have a big impact on the battery. We got roughly 2 hours and 50 minutes out of both earbuds. At 30% voice prompt started saying “low battery, please charge” every few seconds. It’s super annoying and makes listening for the last 30% unlistenable. They should fix this. We got to 30% after less than 3 hours. Now if they remove the annoying “low battery” voice prompt, they could easily claim 3-hour battery life. Moreover, after a couple more minutes the music stopped playing, and the right ear bud turned off and disconnected. The left ear bud stayed connected and showed 60% battery life. It “survived” for 40 minutes more until it shut down automatically. Listening to just one earbud isn’t much fun. I’d rather just turn on my cheap Bluetooth speaker and use that. So, in the end, you shouldn’t expect more than 3 hours of battery life from a full charge of the true wireless xFyro Aria. And that is much less than what you’re promised. It’s a blatant lie that no manufacturer should afford. Sure, you can probably get a better battery if you listen at the lowest possible volume, but that’s not how people use earbuds. If you blast them at max volume, you’ll get even less out of them. It’s disappointing but kind of expected. Remember the: “If something is too good to be true, it probably is.” It holds true in this case. xFyro Aria buds come with a sturdy carrying/charging case. Now when you take the xFyro true wireless headphones into your hands, they feel like a premium product. Well designed and put together. No complaints here. You could be paying $300 for them and be happy. So, just like with the over-promised battery we tested the durability. The manufacturer claims IP67 rating which is equivalent to IPX7. It means you can put them underwater, more on IPX rating here. 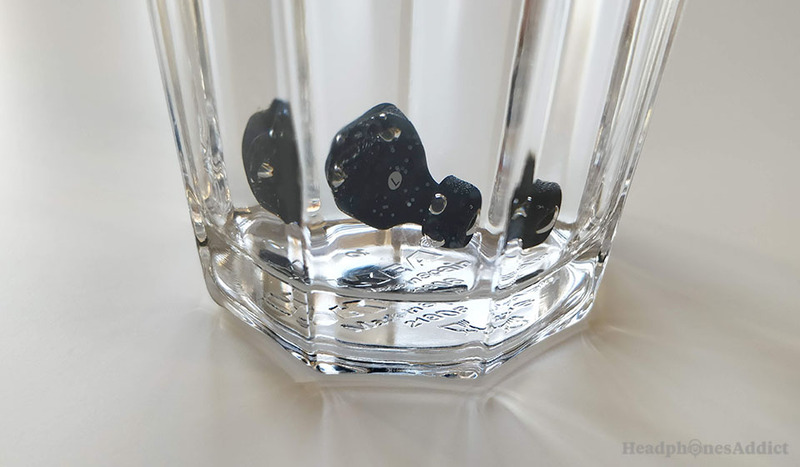 On the official site, you can see a nice picture of the xFyro Aria earbuds thrown into a glass of water. So, we decided to do the same thing. The xFyro Aria survived the dip in the glass of water. You can do the same, you probably won’t make the same dramatic picture, but you’ll see water doesn’t harm them. 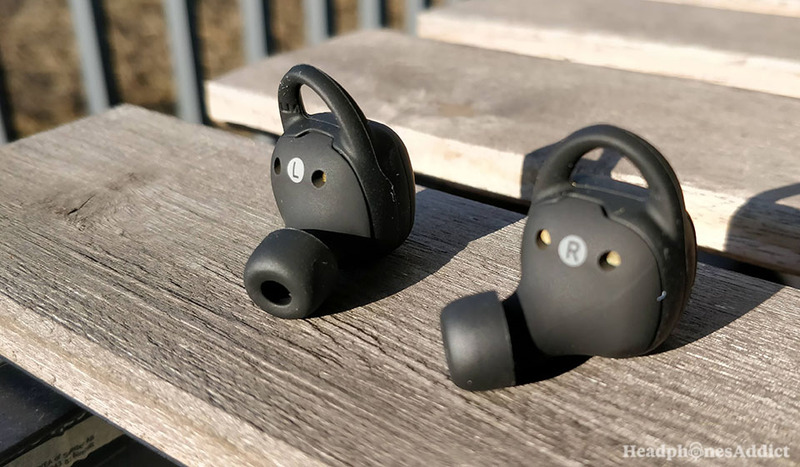 The true wireless earbuds seem to be perfectly waterproof which makes them great for any water activity or sports. But there’s more misinformation here. On their official website, you can see a picture of a swimmer implying these are suitable for swimming. They’re not, because they use Bluetooth which stops working when underwater. You’d get constant signal interruptions and distortion during a swim (unless you keep your head above water at all times). All in all, the xFyro earbuds do well in the build-quality and water-resistance category. You can easily use them for sports. One of the standard features of the true wireless buds is built-in controls. In the case of xFyro Arias, the buttons are clickable and not tap-able. This gives good user feedback but also pushes the earbud deeper inside the ear canal. It can be uncomfortable and usually is. Both earbuds have 1 button, and you can control the usual features with the combination of both, like; play/pause, skip/previous, volume up/down, accept/reject/end calls, activate Siri or Google Assistant and turn on/off and connecting features. Additionally, each earbud comes with a LED indicator that tells you the activity. Are they pairing, are they charging or turned off. Taking a look at the light will answer the question. Finally, how is the built-in mic quality? Well, it isn’t the best. 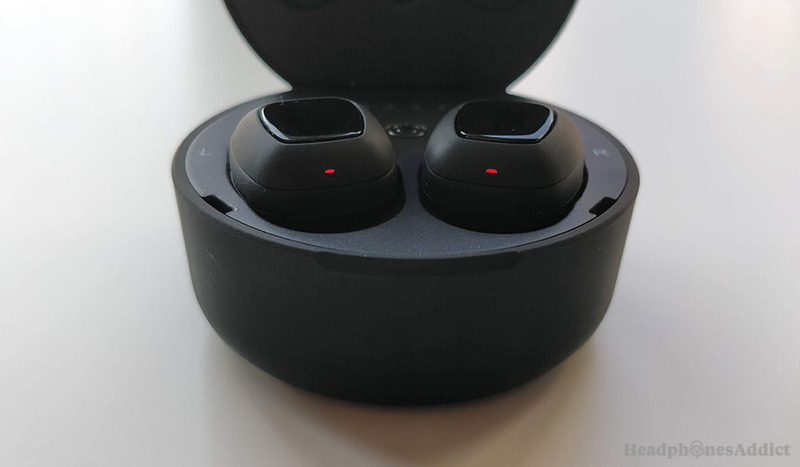 Sure it features a CVC noise cancellation technology and supposedly offers a clear hands-free experience, but we got more complaints than usual. Most people often repeated they didn’t understand us and that the voice quality isn’t that good. Generally, it’s worse than just using your smartphone—most people will know you’re using earbuds. 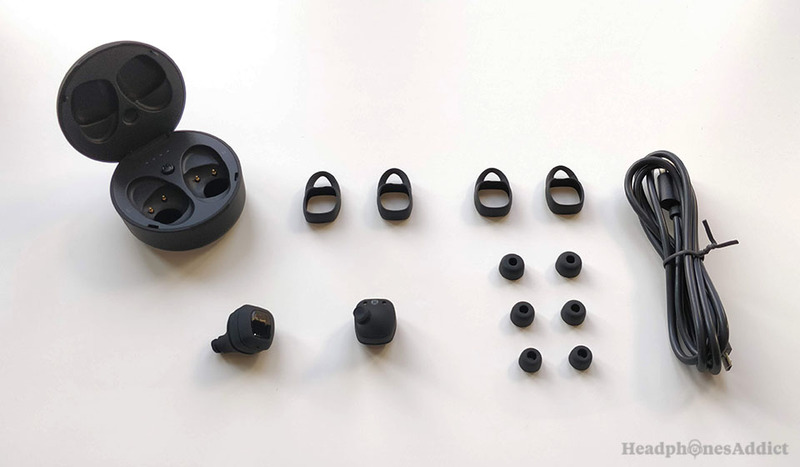 All the accessories of the xFyro Aria true wireless earbuds. The only thing worth mentioning here is the sleek carrying case. It keeps closed magnetically and feels like a part of a premium product. The buds fit inside nicely, held in with a magnet, and you’ll have no problem using it as the charging station and carrying case. The sound quality of the xFyro Aria is good considering these are true wireless earbuds. The sound signature comes across as balanced and pretty clear. This makes it perfect for all genres of music, be it rock, classical or pop. An average user will be more than satisfied with them. That said, for an audiophile, it’s nothing special. You might hear some harshness (sibilance) and slight lack of details in the treble (for some songs), and generally, there isn’t much precision to the music. The bass can be quite deep if you get the right fit, but it’s usually more balanced with the other ranges, which is a good thing. Furthermore, soundstage is kind of private. All is happening inside your head which is the standard for this type of headphones. Overall, all of the ranges are lacking in some department since these aren’t audiophile headphones. 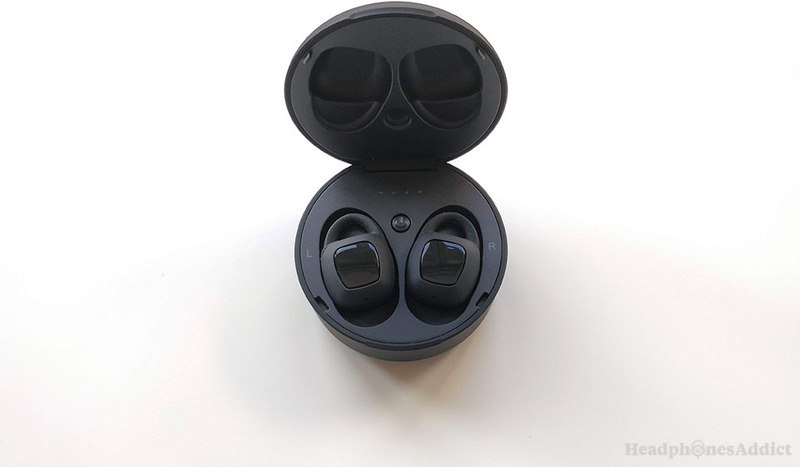 Nonetheless, the audio quality is enjoyable and will satisfy most people looking for good sounding true wireless earphones. And, you shouldn’t be discouraged from buying them simply because they aren’t perfect. A balanced sound signature will satisfy most users. The xFyro Aria are decent true wireless earbuds that attract with good features and affordable price. And while the headphones look fantastic on paper (with big promises), they’re less exciting in real life. There’s nothing majorly wrong with them, they’re actually decent headphones but due to questionable marketing decisions makes them harder to recommend. The over promoted and over promised features that aren’t reality—plus bad user support as evident from online threads—leave a bad taste in your mouth. Get them for around $100 if possible and don’t pay the full price and make sure to lower your expectations, according to our review, to not end up disappointed. Check them out on the official Indiegogo website.